An anti-Treaty IRA column in Tipperary in 1922. Aiken’s Fourth Northern Division would have looked much the same. A rare military success for the anti-Treaty side during the Irish Civil War. By John Dorney. At around 4:00 am on the morning of August 14, 1922, the National Army Orderly in Dundalk military barracks was called out by a sentry to investigate a suspicious noise near the main gate. Inspecting the area, the young officer discovered a cable, linked, he found to his horror, to a homemade ‘mine’ or bomb. He tried to cut the cable, but at once came under fire from Thompson submachine guns hidden in the night. Very suddenly, the barracks exploded into a scene from hell. Four mines exploded simultaneously around the barracks at the barrack gate, the barrack hospital, the officers’ quarters, the headquarters building and the guard-room. Another mine at the main gate failed to go off. Three soldiers were killed instantly and 15 wounded, some buried underneath the debris caused by the mines. The remainder of the 200 strong garrison tumbled out of bed to find a storming party of anti-Treaty IRA guerrillas – the vanguard of a 100 strong attacking force – piling in through the wreckage of the back gate. Within minutes a vicious close quarter fire fight had broken out inside the barracks. Frank Aiken inspects Irish troops in 1954. In 1922 he was a youthful guerrilla leader. The garrison of Dundalk barracks that night were, in the main, IRA men from the 5th Northern Division, led by Dan Hogan, which had been raised around County Monaghan, now part of the Irish Free State’s National Army. The attackers were fighters from the IRA 4th Northern Division, led by Frank Aiken, which had up to a month previously been based in the very barracks they were now attacking. As recently as two months earlier both IRA Divisions had been preparing for an assault across the new border into Northern Ireland. How had it happened that they had come to kill each other in the late summer of 1922? The obvious answer is that the Anglo-Irish Treaty – the agreement which had created the Irish Free State, but disestablished the Irish Republic declared in 1919 – had divided them. On June 28th 1922, Civil War had broken out, first in Dublin and then around the country, between pro and anti-Treaty armed forces. Both pro and anti-Treaty IRA units waged a low intensity war on Northern Ireland in early 1922. Along the border, Treaty allegiances were fluid and unpredictable. It would be easy to assume that Hogan was a moderate, who took the gradualist position that the Treaty was a good enough first step towards Irish independence and Aiken a hard-liner who rejected all compromise of the ideal of an all Ireland Republic. The reality however was much more confused. Both Hogan and Aiken came from the area in the north midlands of Ireland that now had a border running through it. Hogan came from the southern side in Monaghan, Aiken from the northern side, now in Northern Ireland, in County Armagh. Both had been local IRA commanders in the guerrilla war against the British in 1919-1921. Aiken in South Armagh and north Louth, Hogan under Eoin O’Duffy in Monaghan. Both were against the partition of Ireland but both, initially were supportive of the establishment of a new Irish Provisional Government in Dublin in early 1922. Similarly Hogan’s men took up military posts further west along the border. Both were armed and paid by the Provisional government. Part of Aiken’s command under Patrick McKenna did go along with the anti-Treaty IRA executive which disavowed the authority of the Dail, the Provisional government and IRA GHQ in March 1922. Aiken, however tried to remain aloof from the dispute and kept McKenna’s group within the Fourth Northern Division. In Hogan’s Fifth Northern, there were some defections to the anti-Treatyites, but he and his erstwhile chief Eoin O’Duffy remained wedded to the leadership of Michael Collins and his promise that the Treaty would lead to an independent all-Ireland Republic. Both units became involved, with Collins’ blessing, in a vicious low-level war along the border in the spring of 1922 with the Ulster Special Constabulary – effectively the militia force of the new Northern Ireland state. The war over the Treaty is dubbed ‘The Civil War’ but another civil war was fought over the border with Northern Ireland in the spring of 1922. If anything Hogan’s command was more aggressive. In February 1922, they took 21 prominent unionists captive and imprisoned them in Athlone in retaliation for the arrest of Monaghan IRA men in Derry. Later that month they ambushed a train full of Special Constables changing train at Clones, raking their car with gunfire and killing four, wounding eight and taking the rest prisoner. The ‘Clones Affray’ provoked murderous reprisals on Catholic in Belfast –where dozens were killed that month – and prompted streams of refugees across the border. The border war was supposed to culminate with a coordinated ‘joint offensive’ involving both pro and anti-Treaty IRA units in May 1922.For reasons that have never been made entirely clear, Aiken received orders at the last-minute calling off the offensive and his Division took no part in it. This was by no means the end of violence across the border however. Early in June Aiken ordered, in retaliation for the Specials’ murder of two local Catholics, a savage assault on Protestant civilians in the Altnaveigh area of south Down, killing six. One of Aiken’s men recalled, ‘I remember that my feeling at this reprisal was one of horror when I heard the details. Nothing could justify this holocaust of unfortunate Protestants. Neither youth nor age was spared and some of the killings took place in the presence of their families’. Both IRA Divisions in question were therefore ostensibly loyal to the pro-Treaty government but both were also covertly fighting against partition in defiance of the Treaty, throughout the first half of 1922. Events in Dublin, however, where the government, on June 28th opened fire on the anti-Treaty IRA Executive in the Four Courts, effectively forced the end of one type of civil war along the border and the start of another between pro and anti-Treaty nationalists. What of the sympathies of the general population in the area? When the Treaty was signed in December 1921, most local authorities, Farmers’ associations and the like, gave it their support. Moreover in the Free State general election of June 1922, Monaghan elected two pro-Treaty Sinn Fein candidates to one anti-Treaty republican, Cavan elected three pro-Treaty Sinn TDs to one anti-Treaty, along with a Farmers’ Party candidate, while Louth/Meath elected three pro-Treatyites and one Labour TD to one anti-Treatyite. However, pro-Treaty in the border region did not mean pro-partition. Pro-Treaty candidates insisted they were also for Irish unity. Treatyite Sinn Fein candidate Sean Milroy, campaigning in Cavan, for instance was heckled that the Treaty divided Ireland. He retorted that division had already been decided by the Government of Ireland Act in 1920 and that the Treaty would allow them to recover the six counties of Northern Ireland eventually. So although the population in and around Dundalk was probably pro-Treaty in sympathy, divining their political sympathies in the early weeks of the Civil War is no easier than determining those of the combatants. Frank Aiken at first tried to stay aloof from the Civil War. He travelled to Dublin to meet National Army commander Richard Mulcahy, where he turned down a position in that force, but also said he would try to use his influence with anti-Treaty IRA leader Liam Lynch to persuade them to call a ceasefire. Pro-Treaty officer Dan Hogan arrested Frank Aiken and his men in early July 1922, effectively forcing them to join the anti-Treaty side. The Fourth Northern men were given an option to join the pro-Treaty side. Some did so including Edward Fullerton. But many, including Aiken did not and by late July some 300 of them were imprisoned in Dundalk barracks and prison. It was the effective beginning of the Civil War in the area. Just eleven days later on July 27th, some of Aiken’s IRA command under Padraig Quinn blew a hole the prison wall and in fifteen minutes the well-timed operation resulted in the freeing of Republican prisoners, including Aiken himself. In an ambush at nearby Castletown Cross, two Free State soldiers were wounded, one fatally. Hogan’s action, which apparently had not been sanctioned by Richard Mulcahy in Dublin, (but had apparently been ordered by Eoin O’Duffy) had forced Aiken’s hand. He now prepared to free the remaining republican prisoners held in Dundalk barracks. The anti-Treaty IRA’s Eastern commander, Ernie O’Malley, sent a young IRA officer Todd Andrews to Dundalk to liaise with Aiken. Andrews was driven to a farmhouse where he found a large group of IRA Volunteers filling petrol cans with explosives and fitting and priming detonator caps to make them into what republican guerrillas called ‘mines’. Explosives were Aiken’s weapon of choice. Todd Andrews wrote to Ernie O’Malley, ‘Aiken is all out for [a] fight and has definite plans which … will squash the Staters here…. you can have 3-4 tonnes of explosives from here… GHQ stuff dumped in the area… and detonators and .45 stuff [ammunition]… Aiken has evolved a kind of incendiary bomb which he swears by. It consists of a bottle containing a mixture ½ petrol, ½ paraffin…making an oven of an armoured car’. Aiken’s command were unusually well armed with small arms and explosives because they had been supplied up until a month before by the very Army they were now going to attack. Aiken organised boats to ferry his men (roughly 100 strong) across the Castletown river into Dundalk and equipped two storming parties of ten men with submachine guns and 8 mines. The attack on Dundalk, Andrews later wrote with some justification, was, ‘the most spectacularly efficient ever carried out by the IRA’. The attack commenced at 4 am on August 14. Though several mines failed to explode, one did blast in the back gate. The surviving sentries were machine-gunned and the walls breached. 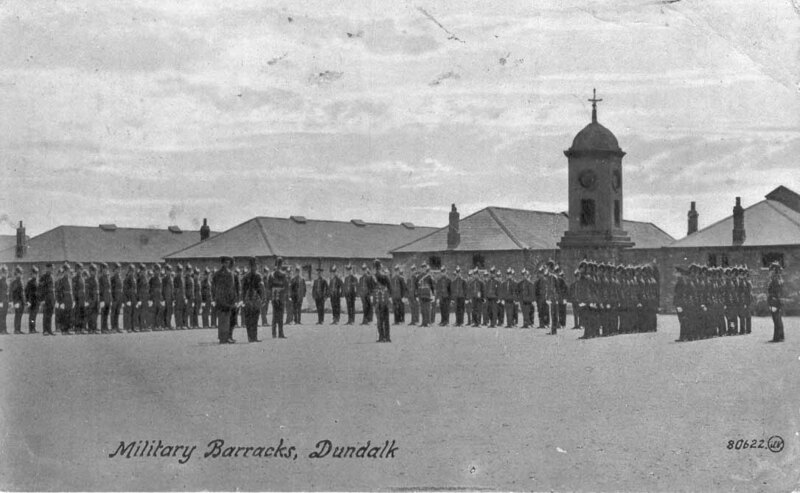 The interior of Dundalk barracks. On the morning of August 14, 1922 it became a warzone. When the republicans’ mines detonated and the storming parties rushed the barracks in Dundalk, it was by no means the end of the fighting. One attacker Edward Boyle recalled, ‘At this time the buildings inside the Barracks were being blown up by our men. We had to take cover under railway trucks at Quay Street Station as chumps of stone slates, gutter pipes, etc. were falling thickly around us from the explosions inside’. ‘After the back gate was destroyed by the explosion Frank Aiken and about nine men rushed the breach and got through. I was on the second wave of men and as far as I can remember was in charge. We got through to the Barrack Square safely. We immediately commenced mining the Officers Quarters on one side of the Square and the Men’s Quarters on the other. A heavy fire was soon directed on to the Barrack Square from some of the Barrack Rooms. We however, got the upper hand as prisoners were captured and got out into the Square. We threw bags of explosives of about 8 to 10 lbs each into the windows of the ground floors of the barrack rooms. When those exploded the inmates generally surrendered. In the military barracks we took about 350 prisoners. The other posts in town surrendered as soon as they knew that the military barracks had fallen’. According to the National Army statement, published eleven days later in the national press, fighting went on for two hours, until the commandant of the barracks, McConnell, surrendered in order to tend to the wounded. Most of the officers had been killed or wounded and some were buried under collapsed masonry. Some 2-300 pro-Treaty troops were taken prisoner. The Army claimed their prisoners were badly treated, with one wounded man forced to walk with a rifle shoved into his mouth. It is difficult to know how seriously to take these allegations. In war, particularly in civil war, propaganda is all. Certainly it is not mentioned by the accounts left by the attackers, but again that is hardly surprising. Regardless, the attack had been remarkably successful and a vast quantity of weapons and ammunition was put at Aiken’s disposal. Over 300 republican prisoners had been freed from the barracks and prison in the town. The bloodshed was not yet over though. 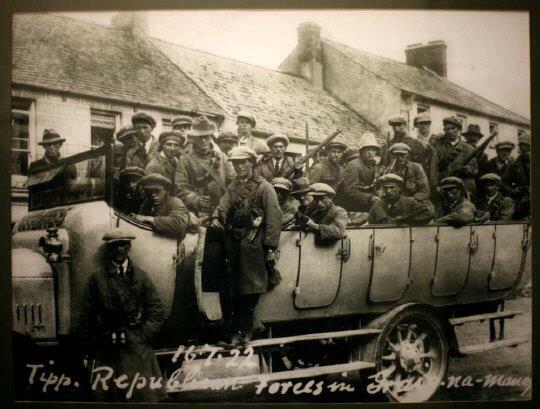 Patrick McKenna, who had long been the anti-Treaty hardliner in Aiken’s Division, had taken a Lancia armoured car off the pro-Treaty troops. When he drove it through the main gate of the barracks after the fighting had ended, his comrades, mistaking it for a Free State counter attack, detonated a mine, killing McKenna and another man Rogers. Much more than Aiken’s well executed and ruthless assault on Dundalk, such blundering, with lethal results, typifies the often farcical but always tragic nature of the Irish Civil War. Five pro-Treaty soldiers were dead or dying and 15 injured. Two republicans were killed, both by their own mine, and up to 30 wounded in the fighting. Reportedly one civilian also died. Aiken held a public meeting in the town centre where he called for a ceasefire. According to the, admittedly hostile, Irish Times, he was booed and jeered by the townspeople who also ‘cheered the National soldiers’. Ernie O’Malley reported to anti-Treaty IRA chief Liam Lynch that 400 rifles and 100,00 rounds had been captured in the raid. Lynch commented, ‘that was a great coup Aiken brought off. I hope he will continue in the War’. After some prevarication, in which he tried to restart talks between the two factions for a truce, Aiken did take the anti-Treaty side in the Civil War. However his command did little more than harass the pro-Treaty troops around Dundalk for the remainder of the conflict. They killed around a dozen more soldiers in guerrilla attacks and in September 1922, took over the town’s power station and cut off its electricity supply, but did little to alter the strategic situation. Aiken’s attack on Dundalk was remarkably effective, but in strategic terms achieved nothing. After the assault on Dundalk, most of his men went on the run and many were arrested on one side of the border or the other. Dan Hogan, arriving from Dublin with a heavily armed column including artillery and armoured vehicles, retook Dundalk without resistance, shooting only an unfortunate civilian who failed to stop at a road block. As it went on, the Civil War, which effectively ignored the issue of partition and the border, must have seemed increasingly futile to Aiken. A report of September 1922 illustrates the difficulties of his position. Ernie O’Malley reported to Lynch, ’He seems to be pressed in against the Border between Free State and Specials and his policy is seemingly to allow things to quieten down in the North Louth area so that he can resume offensive operation when things are quiet’. By the spring of the following year, Aiken was pressing Liam Lynch and the IRA command to call a ceasefire. When Lynch died in a skirmish in the Knockmealdown mountains in April 1923 and Aiken became IRA Chief of Staff, he first called off the armed campaign and then ordered his fighters to ‘dump arms’ and go home – effectively ending the Civil War. The Irish Civil War, along the new border more than anywhere, was a conflict where loyalties could instantly shift. Frank Aiken was not noticeably more or less hardline than Dan Hogan in early 1922, but the two ended up on opposite sides essentially because they were loyal to friends who supported rival factions. From a military point of view, Aiken’s attack on Dundalk was certainly one of the more accomplished anti-Treaty actions but like the fratricidal war itself, neither strategically, nor politically nor, certainly, in human terms, did it accomplish anything. Anglo Celt August 19, 1922, the National Army dead were, Volunteers McGowan, Donnelly, McMahon and Peter Duffy, along with a Commandant, Byrne. Written by: John_Dorney on 14 August, 2013.on 10 April, 2019. 12 Responses to "Today in Irish History, August 14, 1922, The anti-Treaty IRA attack on Dundalk"
A couple of points I’d add: the border kidnappings of Feb 1922 were instigated by O’Duffy, not Collins, in response to Hogan’s arrest by the RIC along with the other “Monaghan footballers” (see memo from O’Duffy to Collins quoted on p285 of “From Pogrom to Civil War”). Hogan was, after all, O’Duffy’s protege so that’s understandable, as is the involvement of Hogan’s 5th Northern in the kidnappings – it was their O/C who’d been lifted. Sean Mac Eoin’s 1st Midlands Division played an equally important role in the kidnappings though; Joe Sweeney’s 1st Northern was also meant to take part but Sweeney came up with some typically mealy-mouthed palaver about how it wasn’t convenient for them to do so just at that particular point in time. Second, quite apart from the capture of Dundalk barracks and Aiken along with it, Hogan seems to have a general talent for getting up the noses of northern IRA leaders. Seamus Woods of 3rd Northern later told Ernie O’Malley of an incident in Beggars Bush barracks (presumably in the late summer of 1922) when Hogan sneered at him “I wish you had been in Dundalk when we captured it”. Woods naturally took offence, so these two alpha males of the northern IRA squared up to each other across the mess-room table and had to be restrained by colleagues from drawing their pistols on each other. Hard to say how much of that was down to Woods’ bitterness over 3rd Northern being left on their own in the abortive May 1922 northern offensive. Eamon Phoenix told me recently that he interviewed Woods’ sister for his “Northern Nationalism” and she told him Woods had harboured a life-long loathing of Aiken for failing to take part in those operations as originally planned. Personal allegiances and rivalries certainly played a part in the disintegration of the wider northern IRA. Thanks Kieran, it’s incredibly difficult to piece together who was really doing what in the period of the ‘border war’, so thanks for the correction. Dan Hogan pops up a lot I’ve noticed in the 1922-23 period. A man worth looking into more perhaps? Anything to say on the vexed question of what teh IRA would have done in/about the north had the civil war not intervened? Not being jesuitical here or anything, but I think that framing the question in terms of the Civil War “intervening” distorts the issue from the outset: it implies that when the Civil War erupted at the end of June, it did so in the middle of the IRA (here meaning both pro- and anti-Treaty factions) trying to do something about the north. My argument is that by that stage, the IRA had ALREADY shot its bolt in relation to the north. The May offensive had fallen apart and while 3rd Northern spent much of the following month gamely trying to burn down as much of Belfast as it could, the introduction of internment in the north coupled with the debacle at Belleek-Pettigo pointed to a determination on the part of both the Northern Ireland and British governments to quash any further IRA attempts at imposing a military solution. At that point, apart from the Tyrone part of 2nd Northern (and, as you point out, small elements of 4th and 5th Northern), the Provisional Government still commanded the loyalties of all five Northern Divisions plus Mac Eoin’s 1st Midlands. In the wake of Belleek-Pettigo, the PG formally decided on 3rd June that neither pro- nor anti-Treaty forces should attempt to invade the north. I argue that this was a mere rubber-stamping of a similar decision made BEFORE the May offensive by the Collins / O’Duffy / Mulcahy “troika”, as evidenced by the countermanding orders sent to both Aiken’s and Sweeney’s divisions telling them not to participate; although there is no direct archival evidence of similar orders being issued to MacEoin and Hogan, oblique references by both Kevin O’Shiel and a very worried PG civil servant in 1924 suggest that such orders were also issued to them. To be sure, the Munster anti-Treaty forces in Donegal continued to raid over the border during June but as both Mossy Donegan and the RUC pointed out, those efforts weren’t of a scale to cause any undue concern in either Belfast or London. All of this was before the draft constitution was published, before the “pact election”, before the killing of Wilson and the ensuing ultimatum from the British. Also before the defeat of Tom Barry’s motion at the third Army Convention calling for resumption of attacks on the British. And before the shelling of the Four Courts. In other words, before the Civil War had even begun, the IRA no longer had the capability (relative to the opposition it would’ve faced from the Specials and British army) nor its political masters the willingness to seek a military solution. The Civil war didn’t intervene in the middle of the IRA’s attempts to do something in / about the north – it followed those attempts. Yes I recall this argument from your book, and largely agree with it. At the level of high politics it’s convincing. But it’s also clear that along the border at local level in Monaghan/Cavan-Fermanagh and Louth-Armagh/Down, there was no slackening of raiding, firefights between IRA ans Specials and of course sectarian killings like Altnaveigh (and it should be said the Specials’ killings that preceded it). It seems to me that it was indeed the southern civil war that put an end to this endemic violence. Very interesting my father was one of the free state troops captured by Aiken in the counter attack he told my brother in law that Aiken recognized them as volunteers he had trained and prevented his men from executing them. Hairy stuff! my grandfatherv wad jailed in dundalk 0n 28th of july 1922,andd freed on 14th august 1922.
he is down as chr mooney h.q.r.s 1st eastern division,and his home is eddestown straffan co kildare. i would like to know how i find out more about him. Hi Brendan, could well be, but I’m afraid I don’t know. Hi my,father was a member of the 4 northern division,o/c mr frank Aikin,from mullabawn,co Armagh,my father was vol James joesph Hayes .56 high high street newry,co down,,I followed dad into The PDF, 1957.. Served 23 yrs 6months,retired 1980.